With his creation of Alf Garnett and Till Death Us Do Part , Johnny Speight (born in Canning Town, London, on 2 June 1920) expanded the boundaries of what was possible in British television comedy. Addressing such previously sacrosanct subjects as the class system, politics and royalty, often in colourful language, he became one of the genre's most controversial writers, notorious for his approach to race issues and ethnic minorities in this and other series. After twenty years and a variety of occupations, an introduction by Frankie Howerd (they held a mutual acquaintance) to Eric Sykes and Spike Milligan led to his first professional work as a writer on the radio series Mr Ros and Mr Ray (BBC, 1955), supplying jokes for bandleaders Edmundo Ros and Ray Ellington . His association with Sykes and Milligan, and their recently established writers' co-operative, Associated London Scripts , led to television work, beginning with sketch material for the opening 4 October 1955 episode of Great Scott - It's Maynard (BBC, 1955-56), starring Terry Scott and Bill Maynard . Other television work from this period includes That's Life Says Max Wall (ITV, 1957), the first series of Sykes and a... (BBC, 1960-65), and the script for Frankie Howerd's triumphal return to form, after the comedian had hit a rocky career patch, on the 6 April 1963 episode of the satire show That Was The Week That Was (BBC, 1962-63). Speight's most notable work in this early period was on The Arthur Haynes Show (ITV, 1957-66). Later to acknowledge Haynes as the first performer for whom he was allowed to write in his own style, Speight introduced the theme of the class war into many of the sketches and imbued Haynes' characters themselves with an overt aggressive quality. This was principally evident through his most popular character, a bemedalled tramp, forever railing against society, particularly the upper-classes. With hindsight, Speight's development of Haynes's tramp persona can be seen as laying the groundwork for the creation of his most vivid and popular character, the bigoted, reactionary, working-class Tory, Alf Garnett. Groundbreaking and controversial in equal measure, Till Death Us Do Part (BBC, pilot 1965; series 1966-75), a slice of East End working-class life, was rooted in Speight's own background, the character of Garnett being a composite of people he had known in Canning Town. However, Speight's avowed intention of mocking right-wing prejudices and exposing them to ridicule unfortunately backfired when many viewers identified and even sympathised with Garnett and his bigoted views. Nevertheless, the series and character were superb comic creations, rightfully winning Speight the Screen Writers' Guild Award for Best Comedy three years running between 1966 and 1968. Never achieving the same degree of success again, his later work was almost inevitably viewed as a disappointment. Even if he had wanted to he could never escape from the shadow of Alf Garnett, returning to the character again and again throughout his remaining career. Subsequent works included the poorly received Till Death... (ITV, 1981), with the Garnetts retiring to Eastbourne, and In Sickness and in Health (BBC, 1985-92), a more successful venture (albeit one that lacked the impact of the original series) which saw the Garnetts return to the BBC and the East End. Speight also transferred the Garnett family to the big screen in Till Death Us Do Part (1969, d. Norman Cohen) and The Alf Garnett Saga (1972, d. Bob Kellett). With its themes of immigration and workplace race relations , Speight's first post-Garnett series, Curry & Chips (ITV, 1969), caused a furore equal to if not surpassing that which had greeted Till Death Us Do Part . Speight again professed to be ridiculing racial bigotry, but, without the saving grace of being even remotely funny, its catalogue of repellent characters, general expletives and a distasteful array of slang terms for ethnic minorities, led to its cancellation after just six episodes. Speight's no doubt sincere if somewhat naive intentions had again backfired. Despite his predilection for comedy, Speight harboured an ambition to write more serious works. His plays The Compartment (BBC, tx 22/8/1961), Playmates (BBC, tx 16/7/1962), both starring Michael Caine , and The Salesman (ITV, tx 30/5/1970) with Ian Holm , were compared to Harold Pinter for their sense of underlying menace. With an unlikely-sounding Marty Feldman stepping into Caine's shoes, the first two were remade as Double Bill (BBC, tx 26/11/1969). First staged theatrically in 1965, If There Weren't Any Blacks You'd Have to Invent Them (ITV, tx 4/8/1968), a rather pedestrian modern morality play on his favoured theme, was an allegorical string of episodic vignettes confined to a graveyard populated by characters symbolising various aspects of British society. It was remade to no greater effect six years later (ITV, tx 3/3/1974). Comedy, however, remained his forte, with later works including Them (BBC, 1972), featuring Cyril Cusack and James Booth as two tramps cut from the Arthur Haynes mould; a pair of sitcoms written in partnership with Ray Galton , Spooner's Patch (ITV, 1979-82), centred around life in a London police station, and Galton & Speight's Tea Ladies (BBC, tx 4/1/1979), set in the House of Commons, with Dandy Nichols , Patricia Hayes and Mollie Sugden as the ladies of the title; The Lady is a Tramp (Channel 4, 1983-84), a distaff version of Them , featuring Patricia Hayes and Pat Coombs ; and The Nineteenth Hole (ITV, 1989), a return to the theme of class bigotry, this time the middle-class pretensions to be found in a golf club, with Eric Sykes as the club secretary. As the television landscape changed in the early 1990s, Speight found his brand of comedy increasingly out of step alongside the growth of 'alternative' comedy and political correctness. He bowed out of television in 1992 with, appropriately, Alf Garnett and the final series of In Sickness and In Health . 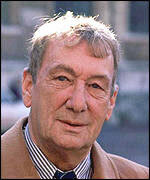 Johnny Speight died on 5 July 1998 from pancreatic cancer. He was awarded a Writers' Guild Lifetime Achievement Award in 1996.